Until the end of the 19th Century, The section of Argilla Road near the intersection with County St. was known as School Street, as shown in the 1884 map. The town’s first primary school was near this intersection, and indeed the South Green was long known as School House Green. Historic Argilla Road crosses pastures and deep woods, then opens up to a scenic vista of the Great Salt Marsh and the ocean on its way from South Green to Crane Beach. 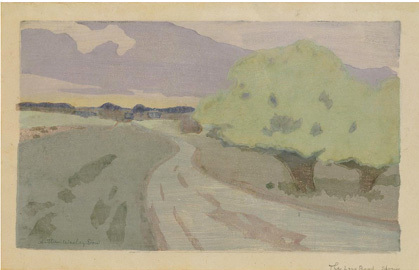 In 1899, Ipswich Artist Arthur Wesley Dow sketched “The Long Road: Argilla Road, Ipswich” in which he depicts a gravel road with a path running parallel as it was before the automotive age. Dow created several woodcut prints of the scene depicting the walking trail converging with the road in the distance. More recent efforts to create a walking/cycling path from downtown Ipswich to Crane Beach along Argilla Road succumbed to opposition by some residents of the road. Argilla Road, with Argilla Farm on the right in the distance. Photo by Arthur Wesley Dow, from cyanotype image. This is a view of the South Green, looking from the former South Congregational Church, which burned in the 1970’s. 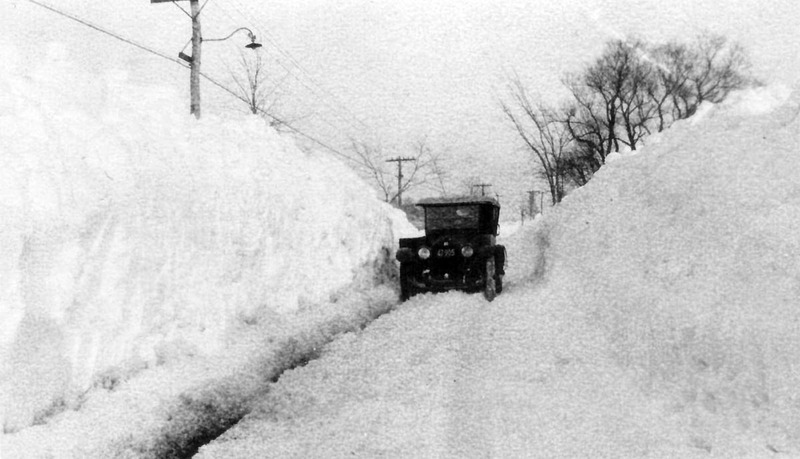 Argilla Road begins at the house on County Rd., visible on the left. The South Green was originally known as School House Green. 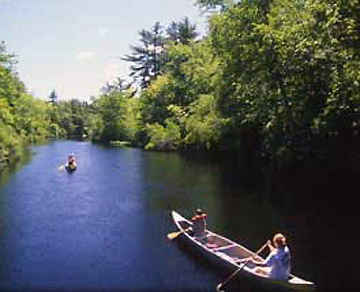 Many of the most important early settlers received grants of land here. 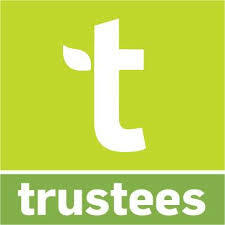 Maplecroft Farm: A 2009 Ipswich town meeting voted to purchase and place conservation restrictions on 247 acres of . 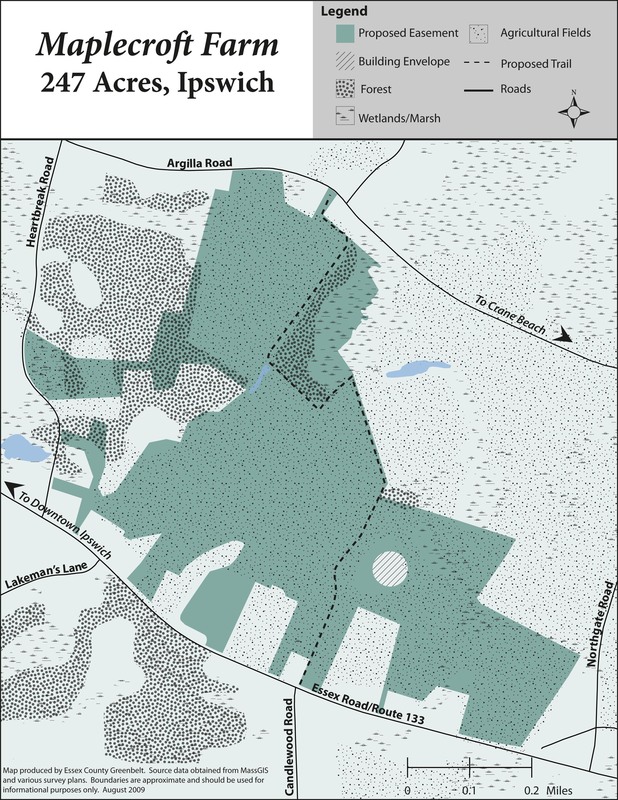 The Essex County Trail Association (ECTA) maintains a 1.4 mile walking trail through the property from Argilla Road near Heartbreak Hill to Rt. 133 at Raymond Field. This is a working farm– dogs and bikes are not permitted. View the trail map for Maplecroft Farm. Russell Orchards has been a working farm since 1920 and has 120 acres of fields, gardens, orchards, and barns. The Essex County Greenbelt Association established an agricultural restriction on the land so that it can never be developed. The Russell family welcomes visitors to the farm store during regular store hours. Other areas are open to paying pick-your-own customers during designated hours. Crane Beach at the end of Argilla Road was voted the most popular beach in the Boston area in a recent poll. The extensive beach, 5 miles of dune trails along Castle Neck and the Crane Castle are managed by the Trustees of Reservations. Castle Hill was owned by a succession of farmers before , J. B. Brown transformed Castle Hill Farm from an agricultural holding into a gentleman’s farm and built the house now known as The Inn at Castle Hill. Richard T. Crane Jr. purchased the property in 1910 and built his grand estate, Crane Castle, grounds and gardens. First and Second Period Houses on Argilla Road, with address, name of original owner, and dates of construction. 107 Argilla Road, Argilla Farm (1785) - In 1637, John Winthrop Jr. conveyed his farm to Samuel Symonds, who became Deputy-Governor of the Colony. It came into possession of Thomas Baker, who married one of Symonds' daughters. Allen Baker built the hip-roofed farm house in 1785. It was purchased by Ephraim Brown and inherited by his son Thomas. 110 Argilla Road, the Hamlin Reservation - The Hamlin Reservation is a 135 acre former coastal farmland, with a rocky forested island surrounded by salt marsh, now owned by the Trustees of Reservations. The house an barn were moved from across the road in about 1916. 12 Argilla Road, the Norman J. Bolles house (c 1900) - The first known owner of this house is Norman J. Bolles, president of the Ipswich Savings bank. This house is a fine example of a Queen Anne Cottage. Features include a wealth of shingle types and an exceptional shingled carriage house in the rear which retains a cupola. 13 Argilla Road, Thomas and Elizabeth Brown house (c 1844) - The simple exterior is enlivened by Victorian elements, including two door hoods with elaborate scroll brackets decorated with incised floral motifs and sunbursts. Thomas Brown is the first known owner of the house (shown in a map dated 1856). 15 Argilla Road, the George Dexter house (1893) - George Dexter was a prominent Ipswich photographer in the 19th Century through 1920. This classic Queen Anne house includes an outbuilding which was used by Dexter as a photography studio. 153 Argilla Road, the Isaac Goodale House (1670) - This First Period house was built in West Peabody before 1695. In 1928 it was reconstructed at 153 Argilla Road by Robert and Susan Goodale. 155 Argilla Road, Asa P. Stone house (b. 1839) - This house is said to have beeen moved to this location from Newbury. Architectural features suggest an 18th Century origin. Asa P. Stone acquired possession and built a barn on the property in 1839. That barn was recently moved to Northgate Road and restored. 168 Argilla Road, the Tilton-Smith house (c 1720) - Built circa 1720 by Abraham Tilton Jr., a 1998 fire took away much of its original frame, but the owner totally rebuilt the home with with materials salvaged from 18th and 19th century structures throughout New England. 17 Argilla Road, the Samuel Wade – S. F. Canney house (1845) - Samuel Wade built this house as a cottage in 1845. In 1856 it was owned by S. F. Canney, whose lumber company burned at its first location by the County Street Bridge, and again at its Brown Square location. 178 Argilla Road, the Stephen Smith house (1742) - Sagamore Hill, which is near Fox Creek and Argilla Roads, was originally apportioned in small tillage lots to a considerable number of owners. The house was built by Stephen Smith, who bought the land in 1742. 188 Argilla Road, the Oliver Cogswell house, 1815 - Oliver Cogswell built this dwelling about 1815. In the early 20th Century it was purchased by Dr. Joseph L. Goodale of Boston, who improved the plain farm dwelling into an attractive summer home. 232 Argilla Road, the Patch-Brown-Crockett house (c 1760-85) - John Patch died in 1799 leaving the Sagamore Hill farm to his grandson Tristram Brown, who built the dwelling, which he operated as a boarding house on the way to the beach. Dr. Eugene A. Crockett bought the property along with its dairy and hay farm in November 1897. 43 Argilla Road, the Giddings – Burnham house (b 1667) - The earliest section of the Giddings-Burnham House at 43 Argilla Road in Ipswich was built in the mid-17th Century by carpenter George Giddings who immigrated from Norfolk, England. The earliest documentation for this property was the deed of sale between George Giddings and his brother-in-law Thomas Burnham in 1667. 50 Argilla Road, the Burnham-Andrews house (1815) - The Burnham farm at one time stretched both sides of Argilla Road. This house was probably moved a short distance to this location by J. Howard Burnham in the late 18th or early 19th Century. 53 Argilla Road, the Samuel Kinsman house (1750-77) - Samuel Kinsman received this property in a bequest from his father Capt. John Kinsman, who married Hannah Burnham in 1733. The house is generally dated circa 1750 with a 1777 wing from an existing structure that was moved. 66 Argilla Road, the George Haskell house (1855) - George Haskell, a lawyer, constructed the large white house on Argilla Road at the base of Heartbreak Hill in 1855-56. A gentleman farmer, he invested his time in a quest for the ultimate wine grape. The Crane Estate - Castle Neck and Crane Beach have a long history of ownership by several families before being granted by the Cranes to the Trustees of Reservations.